Dress Up an Empty Wall with Exciting Graphics! Check out some of the work we’ve done for our customers! Walls, like windows and glass doors, are prime “real estate” for advertising your business. But, they don’t need to be limited to advertising the latest specials. 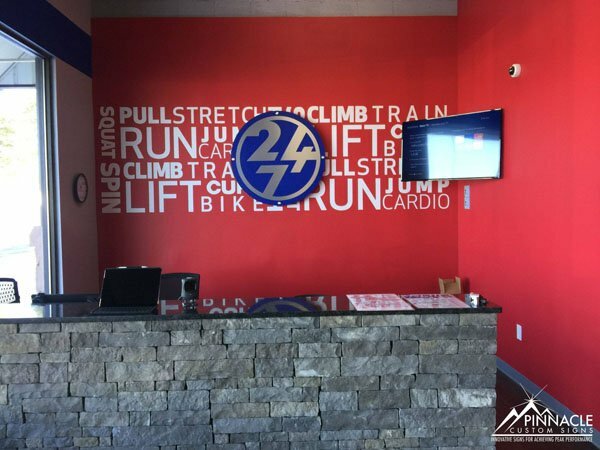 With today’s advances in materials and large format printing, we can create custom graphics to bring life any wall in your office. Are you looking for a custom wallpaper to match the décor in a special room? Maybe, you want to create a mural that tells a story or sets a particular mood. How about decals that represent a special team (or person) to add personality to the room? Stephen took a call back in mid-November from Amanda, a team member at Voice Nation, for door graphics. Voice Nation is a live answering service, offering secretary and live voice mail to their clients. 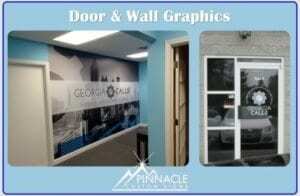 Pinnacle addressed the door vinyl in a quick manner and took care to make sure they were happy. At the beginning of January, Stephen received a call from Josh, Voice Nation’s web designer. They had decided to move forward with some projects they had in mind, including vinyl for the front windows of their suites and a mural on one of their interior walls. Since Voice Nation occupied three suites in their building, they used the window graphics to group them together by using a blue vinyl “runner” which included their logo and tag line across all their windows. They then added their three core values, one across each suite’s windows, above the runner. It was an impressive way to make their presence stand out in the busy industrial complex. Wall graphics are often used to set the mood for an office or other interior space. 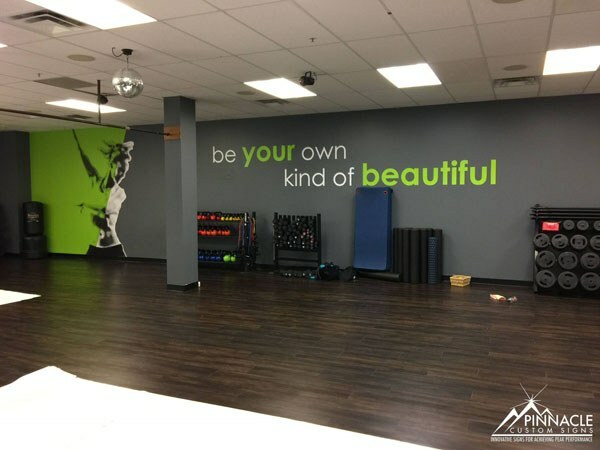 The mural that was created for Voice Nation featured a breath-taking mountain-top scene with a quote by Claude Bissell to inspire their team to go above and beyond when talking to their customers by risking more, caring more, dreaming more and expecting more. Soon after completing these jobs, Josh asked about doing another wall mural and some new door graphics for another new call center they were opening in Buford. When Stephen went to meet Josh at the job site, he was surprised to find out it was the site where we first installed door graphics for them. The door graphics for this site were not as large as those done at their main location, but still had a consistent look. This mural differed from the first one in that featured a city scene with the Georgia Calls and Voice Nation branding super-imposed over the scene. At the end of the project Voice Nation was very pleased with the new signage that is found in the two offices and call centers, making it a pleasant and inspiring workplace. 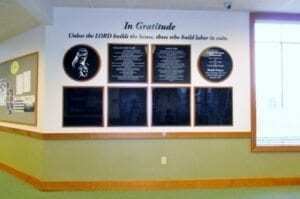 Memory Walls are used to commemorate special gifts given to an organization, such as hospitals, schools, churches, etc., where they would like to show their gratitude by publicly recognizing these gifts. Prince of Peace Catholic Church in Flowery Branch, GA initially contacted us in the summer of 2013 to build a long overdue memory wall to recognize donors that endowed the church with specific gifts from a capital campaign held in 2003, as well as the donors for a set of carillon bells in 2010. They also wanted to be sure that this display could accommodate additional names of future donors, especially since they were embarking on another capital campaign in the upcoming months. We looked at examples on the internet from companies that specialize in this sort of display. However, we later decided to come up with our own design that would allow us to use our Gravograph, a routing and engraving machine we purchased last year. The design of the wall incorporates a biblical verse that stands as the cornerstone of the church as well as the parish logo and the mission and vision statements in addition to donors of both projects. There are also four panels that are currently blank to allow for future names to be added. Routed black acrylic lettering for the text above the panels which includes the words “In Gratitude” and the bible verse mentioned above. The two current donor panels are made from black glossy Gravoglass, reverse-engraved on the back and then painted white. This gives a polished finish that is smooth to the touch and looks like glass. All the panels were placed on wooden backers stained to match the trim work of church’s décor, using black standoffs in the corners. Since only two of the panels currently have engraved names on them, this display allows room for growth to recognize donors in the future. This is just one example of a memory wall. They can be made with many different materials and be as unique as your creative imagination is. Let us know if we can help create a one-of-a-kind tribute for you. Wall graphics can enhance any office space and help you to let your clients know what you are all about. In mid-March, we received a call for some dimensional wall graphics for Ricci Orthodontics, an orthodontics office in Norcross. When Stephen met with Carrie, they were interested in getting multiple sets of dimensional letters throughout the office highlighting their tag line, their logo and their successful smiles. 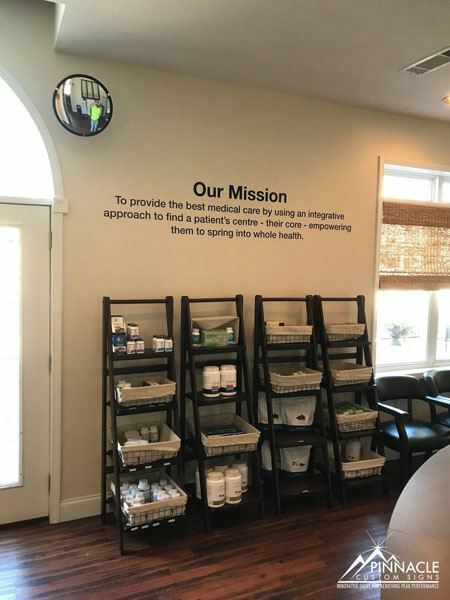 They wanted their patients to know their motto and be able to show off some of their success stories. Stephen started off by suggested using routed 3/16″ black acrylic for a shiny, classy and clean look. As they walked around the office, Stephen took measurements and “before” pictures used to create proofs for the customer. After leaving, he felt confident the project would work out and the signage would give the office the look they were trying to achieve. However, when he got back to the office to discuss what he had just “sold” to the customer, he learned that some of the locations for the intended dimensional letters would not work with acrylic, due to the curvature of the walls in these places. Therefore, we had to come up with another way to achieve this same look, using a material that would work with not-so-flat walls. After discussing various options, Matt, Joanne and Stephen decided to use 1/8” black PVC in order to achieve the dimensionality and cover it with black cut vinyl to achieve a sheen similar to the acrylic. The thinner PVC would be more flexible than the acrylic and would allow the letters to conform to the curved walls. When Stephen went back to meet with Carrie and discuss this option, they were happy to see that Stephen came back to them with an option that would give them the desired look and still lie flat on the wavy walls. They decided to move forward with the job, using the acrylic lettering on the flat surfaces and the PVC with cut vinyl on all of the curved surfaces. As the installation occurred, the whole crew watched as Matt and Stephen put up the different sets of letters. They were all ecstatic as each sign went up, and in the end were happy with the final results. Using dimensional letters, as we did for this project, is just one way to use wall graphics to enhance your office space. 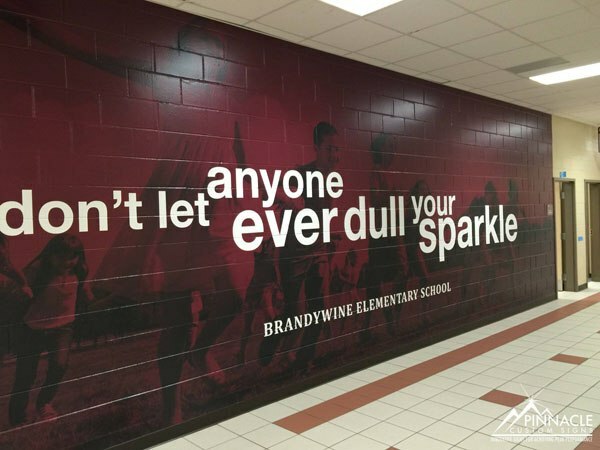 There are plenty of other options that will allow you to use your walls to convey your message to your clients. We can create custom wall graphics that will make any room unique. 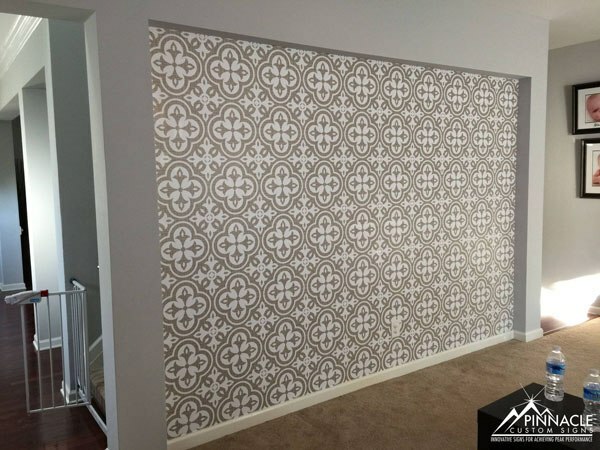 Our team will work with you to understand what you are trying to accomplish and recommend the best material to give that wall an exceptional look. Give us a call at (678) 714-8700 if you are interested in livening up your office walls. Or, if you’d prefer for us to contact you about some unique wall graphics, please complete the form below and click the send button.